Want to Use the Viking Color Palette in Your Website? Scientists have discovered the favorite Viking colors and now you can use them in your website! You don't have to bring a Viking in the office for a color consultation anymore. Plus - here are some observations on the history of colors. Scientists and archeologists have recently been able to identify the favorite colors that Vikings used on their houses. Archeologists had found timbers from the Viking Age that were used in construction of houses and great halls.. They decided to check in the crevices and cracks in their Viking logs and planks. To their surprise they found Vikings used a range of colors. Another problem was that the colors they found had changed in hue over time and it took considerable study and analysis to be able to recreate the Viking color palette. The researches have now published their findings and the Viking color palette is both rich and subdued. The pigments used were all from natural sources that could be found near where the Vikings lived. One could say that the Viking palette is earthy. These colors could be found today in the Eddie Bauer collection of paints you can buy at Lowes. If you want to buy colors from Viking palette for your own home you can do it by using the RGB values I have given below. Or you can download the image of the colors below and take it to Lowes. I think the ancient Vikings were very similar to us today in the pride they took in their houses and how they wanted to show off their wealth and success to their neighbors. Since now we know all Viking homes were painted like this it's obvious that Vikings knew which paints cost more or were harder to get. Using expensive house paints was a way of demonstrating your success. It's also obvious that the Vikings painted their houses in these colors because they liked them. Colors were very important to them in clothes, on their ships, wagons and obvious things like shields. We don't know how the Vikings got their paints. Did they have Viking versions of Lowes and Home Depot? Did you mix your own paints as Viking DIYers? Looking back in time I thing we imagine Viking times as much m9ore primitive than they were. Big Viking towns like York and Dublin had plenty of shops selling all sorts of stuff. Like today people wanted to show off and wear the latest fashions. The Vikings had far flung commercial relationship with places as far away as Constantinople and Baghdad. People will always dress as well as they can afford. The Vikings wore fine wools, velvets and even silks; set off by fine silver jewelry. Fashions could be set my far away urban centers - like Paris and Rome and styles of clothing, their cut and ornament was closely followed by men and women. We know Viking warriors could be more vain that their wives and girlfriends and wanted to spend money on their own attire. Warriors were very conscious of how they looked going into battle. You had to have the latest clothes and armor to convey your own wealth and power to your brother warriors. The warrior class was quite vain. Some colors, like dark bright reds like what they would have called Imperial purple. were very rare and were reserved for Royalty. “It’s an important study because it presents the chemical analyses that form the basis for the very subjective ideas that archaeologists have on Viking Age color,” she says. “On the rare occasion that we excavate a piece of painted wood, the color looks nothing like the original. Here, chemists and conservators analyze the pigments and help us to further our interpretations,” says Lyngstrøm. They also discovered that the Vikings used Linseed Oil as a binder for their paints. In Southern Europe the binder was either milk or Egg. You many not know that today's acrylic paints ruse a milk-like binder. The use of linseed oil in mixing and binding pigments spread south to Italy and eventually became the dominant method of painting. The Vikings used linseed oil - the first reason was it was easy to get and was a better seal against water and the elements. Another person who worked on the project said “When we’ve previously excavated finds from the Viking Age among others, we weren’t so interested in colors. Partly because we didn’t have the techniques to study pigments, but also because we assumed that the colors appeared more or less as they were found,” says Line Bregnhøi a conservator in the National Museum of Denmark. Bregnhøi and her colleague Lars Holten have used the advanced techniques now available to create the color palette used in the reconstruction of the largest Viking building discovered in Denmark. The Royal Hall, as the building is called, was reconstructed at the Centre for Historical-Archaeological Research and Communication in Denmark (as also known as Sagnlandet Lejre). It uses the same type of paint used by upper class Vikings. “We know that the symbolism of colour is enormously important in all cultures. Red, white, and black are some of the most common and have similar symbolism among numerous cultures,” says Holten. One of the more expensive colours is the red ‘cinnabar’ and it was likely used by chieftains or princes as a status symbol to demonstrate power over their surroundings, says Holten. The house we see above was a high status one, imagine a Viking lord living there in his silks and silver ornaments. If he had been to Constantinople he might build an even bigger house, paint it in beautiful colors and tell his neighbors that it was as beautiful as the Great Palace of the Byzantine Emperors on the Bosphorus. The Vikings called Constantinople Miklagard - the GREAT CITY. He could have described the red cinnabar color as being Imperial Byzantine Purple. he could order furniture made based on the designs he had seen serving the Emperor. "That chair is exactly like the one Emperor Manuel Comnenus sits on". No one would know unless you had been there, too. Even today people like to brag that they know the latest fashions and colors in our own culture. The reconstruction of a the Viking house was done with the new colors from the rediscovered color palette. There is a debate on how bright the original colors would have been and how fast they might changed or faded on exposure to sun and the elements .The red is cinnabar, a high-end pigment that is close to the color of red brick. Using in it such quantities would have been an expression of wealth. One should remember that Northern Peoples loved the color red and the Russians developed a passion for it in its purest hues. The house above is a restrained reconstruction. I think they were hesitant to go too far with color here. I am sure the Vikings would have painted covered more of the house in brighter colors. We know from the Viking color palette that they used golds, oranges and greens - lots of ochre colors. They even used a light blue and lots of black. Ochre colors can be found naturally in lots of places all over Europe. All you have to do is find it, dig it up and refine it to make it ready for the binder. In the Viking age people were really talented in making paint colors and dyes. Some of the processes they used involved many steps and great skill. The process to make it was pretty disgusting. Woad was a yellow-flowered European plant of the cabbage family. The blue dye was extracted from the leaves after they had been dried, powdered, and fermented. If you could get the leaves almost anyone could make the dye. This blue remained the standard blue for cloth until Indigo dyes were discovered from America. There were home-brew formulas for other colors like greens and yellows made from natural sources that were really beautiful. If you were doing your own spinning and weaving of cloth you were also doing the dyeing of it. As societies develop home industries evolve into co-op like organizations and the formation of factory like workshops that made things in quantities. Like today the production of weapons, military clothing and armor by the King or state was the economic engine that created industrial scale production of things. Every year tens of thousands of things were made to arm men and Viking ships. One of the questions about colors from Viking times is what were they called? Colors are described in the Viking Sagas in many different ways. 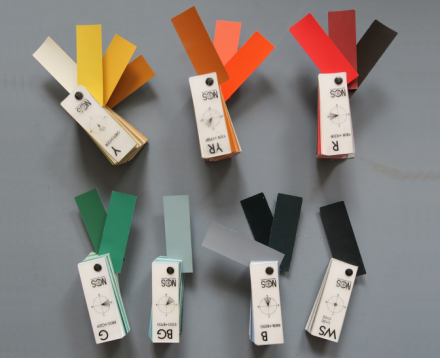 there was no standardization of color names. A Viking might call a blue, Ona's Eyes or Northern Sky. Colors had these types of names, rooted in places, myth and real people's lives. Color names could also be associated with plants - like pine green or rose pink. There could be a dozens of names for the color woad across Europe. The creation of workshops and the mass production of cloth made the standardization of colors and dyes important. Also Vikings imported pigments from abroad from more advanced countries where color palettes were pretty standardized and had names. For example, at this time there were stores selling pigments by color name in Constantinople. The Vikings had a close relationship with the Byzantine Empire. Vikings Hundred of Vikings had been enlisted in the Byzantine Emperor's personal bodyguard called the Varangian Guard. These Vikings were constantly going back and forth to Constantinople and were bringing clothes and other luxury goods from there. They also brought Byzantine dyes. One of the main shops for dyes and pigments was near the barracks of the Varangian guard in the heart of the city, in a street just outside the Great Sacred Palace. Besides gold the Emperor made regular gifts of silks and other fine cloths to his guard as rewards for service. Some of the silks and velvets were already made into luxurious Byzantine clothing like silk caftans and dresses. The imperial court was tightly organized by rank. Based on the title you had you could wear certain hats and colors - or have permission to ride a horse in town. The Varangian Guard officers were given actual Byzantine titles. These viking guards would have known everything about court rank and the Greek names for colors associated with them. These Vikings were often involved in commercial ventures in Constantinople involving the import and export of the rare and precious things that could only be found in Byzantium. Because Vikings were coming and going back and forth to Scandinavia by boat they could transport stuff back and forth. The guards good amass great wealth in money and goods during their service and took as much back home as they could when hey returned. Its a curious thing but Viking taste was not the same as the Byzantine. For example, the Vikings preferred silver over gold. Although Byzantine court costumes were made of rare and exotic fabrics, they had very high status back home and were worn by Viking and Anglo-Saxon royalty and the higher nobility. Alfred the Great wore beautiful Byzantine caftans and cloaks made from silks woven in the Imperial Silk workshops. Monarchs like Alfred were keenly interested in Byzantine court ceremonial and interviewed Vikings and Anglo Saxons who are served in Constantinople to fill him in on how things were done there. European monarchs sought luxury products from Byzantium to enable them to show off their wealth and power to their people. They also patterned their coronation services on the Byzantine ceremonial. Indeed even today the Coronation rite of England is derived from Byzantine practice. Looking at the great house above one can imagine it would have been build for a high-status or wealthy person. A Viking who had returned from Byzantium might have brought clothing furniture and glass back with him. He could have ordered his house to be painted and compare it to the palaces he had seen in Constantinople. He could have described the red-cinnabar used as being identical to the Imperial red reserved for the emperor. He could point at a chair and say "Emperor Manuel has one just like it!". people are always bragging about being in the know when it comes to the latest colors and fashions. Things were no different in Viking times. I have checked the color samples the archeologists have made for their Viking palette and here are the RGB equivalents You can see the sample picture below. 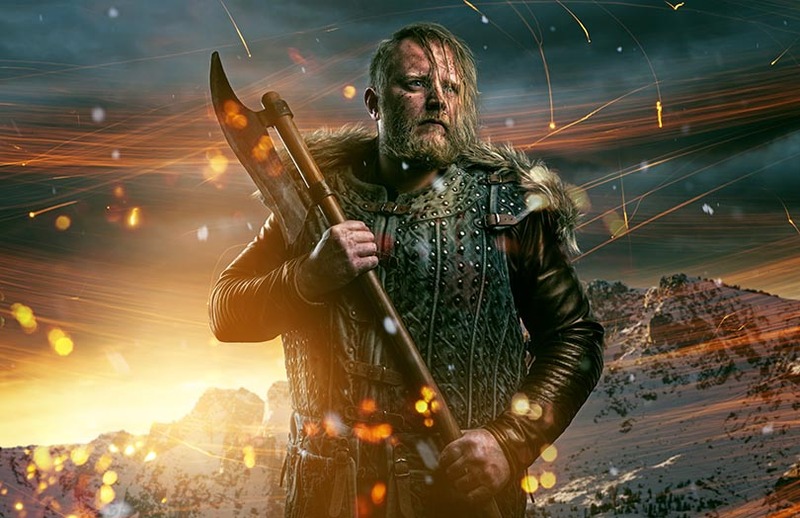 With these RGBs you can now create your own website palette for a Viking themed site. You now longer need to find a Viking to tell you what a a Viking color palette might be or do anymore searches for it on Google. I have been particularly interested in Vikings and Byzantium because my ancestors, the Earls of Orkney - specifically Lord Rognvald, traveled with Thorfinn Sigurtsson to Kievian Rus and on to Constantinople where he went into service there. This journey was described in the great Orkyinga Saga. I have written another blog on this - you can read it by clicking here. I have spent years looking at pictures of Austin - and these are my favorites - the most outrageous beauties! I have added some comments about colors and life in Austin. How to End Annoying Robocalls - OMG a Solution! Get rid of Robocalls. There is a free solution that really works - it's called Nomorobo and we love it. Scientists have discovered the favorite Viking colors and now you can use them in your website! Here are some helpful hints and direction on the skills and knowledge your web designer should have. Here's a list of the essentials you'll need to create your new home builder website. It's a list of all of the building blocks you'll need to make your site a success. Optimizing the speed that your website's content loads - will inevitably increase customer satisfaction, keep them on your website, reducing its bounce rate, and hopefully make them return visitors. save as many as you can! With Austin making headlines and ending up on virtually every "Top 10 Best City for..." lists -- we now have about 150 people moving here daily!! We figured we should warn potential new residents of the hidden dangers of moving to Austin. How I discovered my ancestor Pocahontas and her Sullivan family descendants of Northern Virginia using the web - a genealogy posting by Bob Atchison. Did you know that really was a profession? In 1961 you got paid $500 per letter, that would be $4100 today! When we build a new website for our home builder clients, we always try to focus on implementing "best practices search engine optimization (SEO)" to maximize their placement in organic search engine results. As you have probably read it has been extensively reported that Golden Gate Killer was found using data from GEDmatch. It's an amazing story. Pallasart launches new real estate website for Matthew Church, an Austin Keller Williams Associate. The site has many cool features that will help Matthew offer his services and attract new customers. Olson Defendorf, the top award-winning Texas custom home builder, creates a new brand image and redesigns website. Click here to see what they just did in 2018. The Moorings in New Harbor did a total redesign of its website and added an availability and booking system. Here are some images showing my favorite semi-precious stone animals with jeweled eyes from my collection and stories of the stones and where they come from. Why do my website fonts and photos look blurry in Windows 10? When users install or upgrade to Windows 10, "display scaling" may be turned on "by default" to either 125% or 150% resulting in blurriness when viewing websites or applications on certain monitors. We've been in the web design business since 1996, and have seen many small businesses make these easily avoidable but often costly mistakes with their websites. Should You Use Live Chat in Your Website? Here's an informal overview of live chat options, outlining how Olark, one of the leading providers, works and its features. We explain how live chat can increase online sales and generate leads no matter the size of your company. Bob Atchison's guide to find rare, antique and cabbagey roses to order online. Here you'll find the best sources with roses I especially love and recommend for your garden. If you are a realtor or real estate broker, you need a website to advertise your business and attract new clients. Get clients to stay on your website by providing access to Multiple Listing Service (MLS) real estate listings. Is Scotty Bowers Telling the Truth About Hepburn and Tracy? The unspoken fear all web designers dread - you've been asked to use cursive fonts! There is no escape... yes, it has happened to me, Bob Atchison, many times and I have the battle scars to prove it. Here are some cursive fonts I actually like. Should You Use WordPress for Your Website? We get asked this question all the time... Should I use WordPress? Here are some of the top considerations to examine when deciding if WordPress is the right choice for building your website. As homes in Austin, Texas are getting more expensive and selling for well over $1 million, many home builders and real estate agents are turning to aerial drone photography and videos to showcase their listings. Most people do not realize that bronze statues have artificial patinas applied to their surfaces. This blog article discusses the types of bronze patinas and how to recognize them. TECH ADVICE How to End Annoying Robocalls - OMG a Solution! WEB DESIGN Want to Use the Viking Color Palette in Your Website? We are one of the leading developers of home builder websites in the USA with years of experience in designing powerful sites that are easy to navigate. No matter what the size of your business we can work you to structure a site that showcases your unique talent brand identity. We can offer you lots of great features, floorplans, lots, elevations, choose your own finishes, videos and spec homes for sale. Besides being beautiful, our sites are easy to use and update. Call us at (512)469-7454 and let's talk about your project. Over the years we have built hundreds of sites for online retailers. We specialize in building complex custom shopping carts tailored to your specific needs in open source PHP. We have the technical abilities to integrate your shopping cart with many third party services that use APIs - such as Teapplix and ShipStation for easy shipping and order fulfillment. We can also work with common shopping cart solutions from X-Cart, WooCommerce for WordPress, OpenCart, osCommerce, and Magento. Call us at (512) 469-7454 and let's get your new website into production. In every city there are hundreds of businesses that provide professional services. Most business search for services on the web. If you don’t have a website your chance of landing new accounts is greatly reduced. It is really important that companies have a site that tells your brand story and the services you provide in a compelling way. We focus on your business objectives in creating a site and can provide design, programming, copy writing support. We even do logos. You can reach us at (512) 469-7454. We’ve created sites for real estate companies providing commercial and residential services to both buyers and sellers. From beautiful online brochures to complex sites with hundreds of listings we create sites for firms of any size. We have the capability to work with various MLS (Multiple Listing Service) data providers to add home listings to your website via an IDX (Internet Data Exchange) feed. Some common third party services that we can work with include IDXBroker, Diverse Solutions, and rewIDX. Let's talk about your new website today - (512) 469-7454. We’ve created websites for highly successful businesses in these fields. We can offer everything from wholesale to retail with online stores that can sell a huge range of products. We understand the complexity of selling mass produced and one-of-a-kind items. We also understand the issues associated with sizes, colors and the big images you’ll need to sell your products online. Our carts are easy to use and update. You can easily manage items, inventory and shipping from the custom website we’ll build for you. Let's get started - (512) 469-7454. Over the years we have built websites for resorts, hotels, inns and ranches in Texas, the USA and around the world. Pallasart can integrate third-party reservations systems or build custom-made solutions for you. We can also build complete - and complex - payment systems from booking to check-out using Pay Pal, Authorize.net, Stripe and other payment systems. We specialize in building websites for small to medium sized properties that are family-owned. In the beginning - 1997 - our business was global from Paris to California and New York. Today more of our new customers Texas-based. People know and love Austin and the Hill Country. Austin City Limits and SXSW attract people from all over the world. Many of the most trusted brands - like Whole Foods and Dell - are based in Austin. We love it when we get the chance to create websites that want feature Texas or Austin in their products or marketing. We also have huge databases of Texas images to feature in the sites we build. You can reach us at (512) 469-7454. Over the years we have created websites for many of the biggest brands in wine, beverage and food sales that have millions of dollars in annual sales. We create sites that offer hundreds of brands, thousands of products and brands in online sales. our shopping carts are easy to operate and can handle any level of sales. Pallasart builds sites for caterers, food producers, websites that can support retail and wholesale sales. we understand the unique issues of shipping and cross-state line sales.